When Clay Matthews takes the field against the Cincinnati Bengals on Sunday, he’ll have his sights set on becoming the Green Bay Packers all-time franchise sack leader. Matthews has 74 sacks in his career, which started back in 2009. Kabeer Gbaja-Biamila (74.5 sacks) is the all-time franchise leader, leaving Matthews a half sack shy of sharing the record and one full sack from moving into the lead. Matthews is tied for the second-most six-plus-sack seasons in the NFL since 2009 with seven. Former Packer Julius Peppers (Carolina/Chicago/GB) is the leader in that category with eight. Matthews ranks in the top five in sacks since 2009 among active players. Miami’s Cameron Wake tops that list with 81.5. Houston’s J.J. Watt is next with 76. Matthews has put himself in some elite company and he’s not even close to being done. The Green Bay Packers have many needs heading into the first round of the 2017 NFL Draft tonight. Cover corner and a pass rusher top the list. After losing Sam Shields, the Packers struggled in the secondary last season. They also struggled to rush the passer and will enter the season without one of their top pressure players in Julius Peppers, who signed a free agent deal with Carolina. 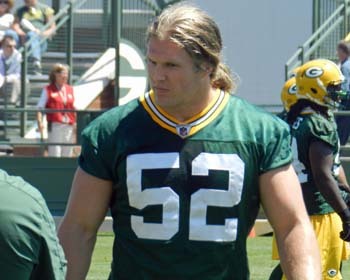 They’re hoping Clay Matthews can stay healthy this season after he had one of his worst seasons. 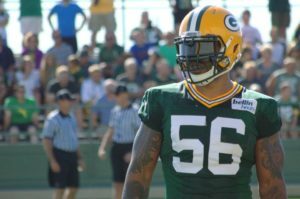 After taking some time to reflect on his future, veteran outside linebacker Julius Peppers is planning to play again in 2017. Peppers, who just wrapped up his 15th NFL season with the Green Bay Packers, is the only player in NFL history with 100 sacks and 10 or more interceptions. Peppers agent, Carl Carey, told ESPN that Peppers has at least one more year in him. Peppers completed a three-year, $26 million contract with the Packers and is set to become a free agent. 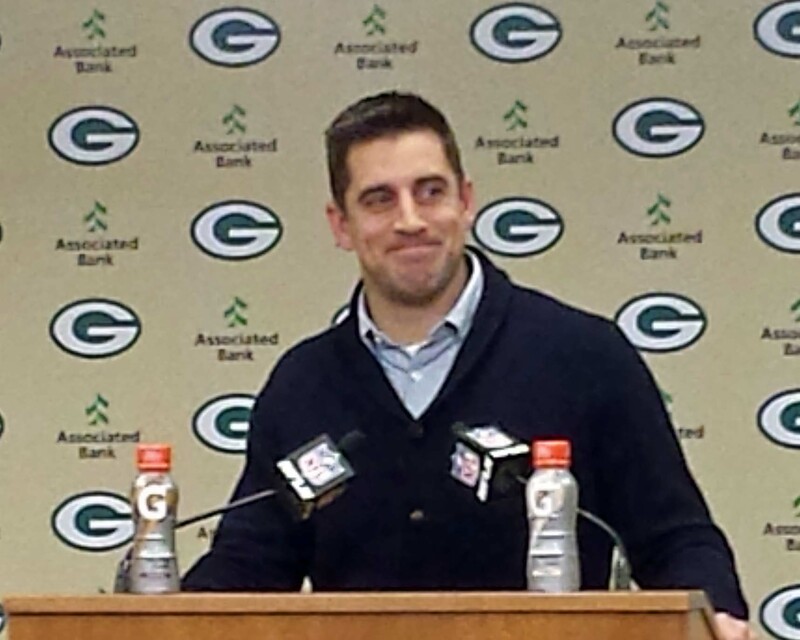 Carey said he met with the Packers over the weekend at the NFL scouting combine. Peppers recorded 25 of his 143.5 career regular-season sacks with the Packers. In his three seasons with the Packers, Peppers didn’t miss a single game. 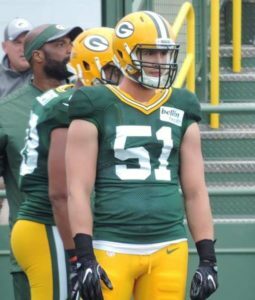 Green Bay Packers linebacker Clay Matthews says his hamstring has improved and feels there’s a good chance he will play Sunday against the Indianapolis Colts at Lambeau Field. Matthews took team reps in practice on Thursday. Last Sunday’s game in Atlanta was the second game that Matthews missed this season. 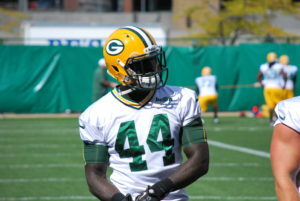 He was also absent for the week three game against the Detroit Lions. Without him on Sunday, the Packers managed just two quarterback sacks in the one-point loss to Atlanta. After weeks of offensive struggles, the Green Bay Packers came to life on Sunday, beating division foe Detroit 34-27 in the home opener at Lambeau Field. The Lions were missing top defensive players Ziggy Ansah and DeAndre Levy and the Packers showed no mercy, putting 31-points on the board in the first half and taking a 31-3 lead into the locker room at halftime. 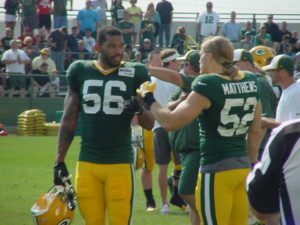 Green Bay Packers linebackers Clay Matthews and Julius Peppers, along with Pittsburgh Steelers linebacker James Harrison have been cleared of any wrongdoing by the NFL. The NFL found no credible evidence that Pittsburgh’s James Harrison and Green Bay’s Clay Matthews and Julius Peppers were provided with or used substances prohibited under the NFL-NFLPA Policy on Performance-Enhancing Substances following a comprehensive investigation into allegations made in a documentary by Al-Jazeera America.